cabinetry, specialty doors and wall paneling systems. JFV’s commercial niche is boardroom tables and furnishings. 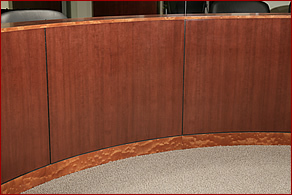 All of these products emphasize specialty veneer components. Veneer Source meets these requirements for JFV on a daily basis. Veneer Source can do the same for you! Because we know how to build your end product, we are better at manufacturing the veneer panels you need. The custom process starts with customer ideas, thoughts, wishes, sketches, and photos. Since each job is unique, we prefer to discuss the whole job, to know the entire scope of the project so we better understand what the end user (your customer) is trying to achieve. The information we gather helps in several ways: selecting veneers, determining veneer matches, suggesting alternative ideas for better finished products, and better pricing for you. We try to put ourselves in your shoes as we do our veneer selection, the panel layout and the pressing. We want your product to be better. Although the forest contains 40,000 different species of wood-30% of the earth's surface is covered with forest, 10.5 million square miles of which are managed forests - there are only 600 species that can be used commercially. Of these, only 28 species cover around 75% of the industrial demand for wood, and then only a small amount of these can be utilized for veneer production.